L-R Vivek Kapoor (Head of Global Growth), Angela Omondi, Meghna Patel, Mikul Shah (Managing Director) & Prakash Dooth. 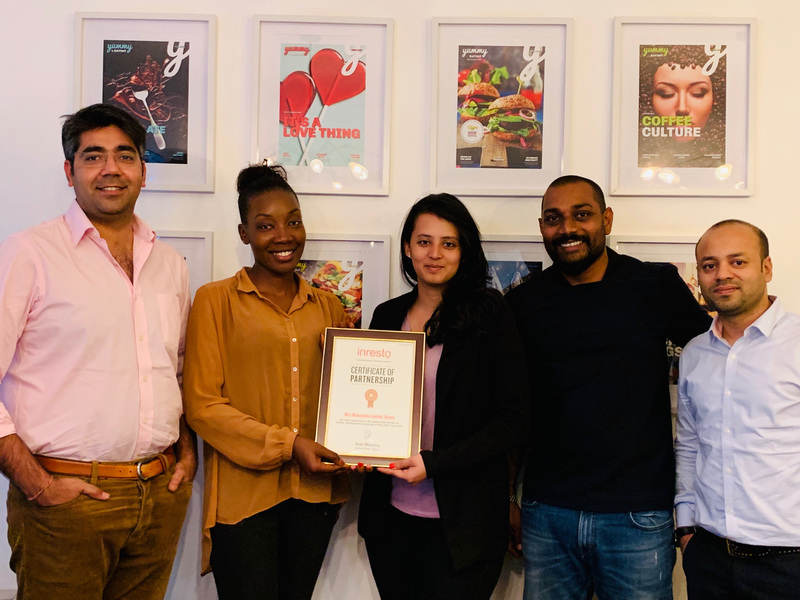 EatOut and Dineout India have partnered to launch Dineout’s InResto Restaurant technology platform to their restaurant partners in East Africa. InResto works with over 12,000 restaurants, bars and quick service outlets who are spread over India, Bahrain, Dubai, Oman, Qatar & Singapore. EatOut’s is a food tech and media platform based in Nairobi. The company’s mission is to promote and grow the culinary industry in Africa. EatOut also publishes Yummy & Nomad Magazines (Kenya’s leading food, drink and travel lifestyle publications) and hosts some of the largest culinary events such as Nairobi Restaurant Week, Kampala Restaurant Week (through its subsidiary in Uganda) and the popular Burger, Pizza, Beer, Cocktail & Wine Festivals. EatOut was founded by Nairobi based serial entrepreneur, Mikul Shah in 2010. The company raised investment from Netherlands based Africa Media Ventures Fund & local FinTech player Craft Silicon, among others and has partnered with the likes of Visa, East African Breweries, Safaricom, and Nation Media Group. Its mission is to promote and grow the culinary industry in Africa. EatOut also publishes Yummy & Nomad Magazines and hosts some of the largest culinary events such as Nairobi Restaurant Week, Kampala Restaurant Week and the Burger, Pizza, Beer, Cocktail & Wine Festivals. Founded in 2012 by Ankit Mehrotra, Vivek Kapoor, Sahil Jain and Nikhil Bakshi, Dineout is the easiest way to discover the best restaurants in India. It is a technology service provider in the online restaurant-booking space, is India’s largest dining out platform. Dineout was acquired by Times Internet Limited in April 2014.